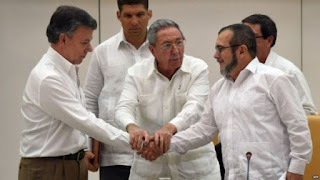 The Colombian government and left-wing Farc rebels are set to sign a historic agreement deal that formally brings an end to 52 years of civil war. The last of the major Cold War conflicts killed 260,000 people and left six million internally displaced. President Juan Manuel Santos and rebel leader Timoleon Jimenez, known as Timochenko, will use a pen made from a bullet to sign the deal on Monday. The president says the deal will boost economic growth and unite the country. “War is always more costly than peace,” he said in an interview with the BBC, warning that it will take time for Colombian society to recover from more than five decades of conflict.